Nemaska Lithium CEO Guy Bourassa discusses a range of topics, including the company’s Whabouchi project and Phase 1 Plant in Shawnigan. According to Nemaska Lithium (TSX:NMX) CEO Guy Bourassa, the company has been having a solid 2017. Nemaska’s focus is to become a supplier to the emerging lithium-ion battery market through its wholly owned Whabouchi spodumene mine project in Quebec. In August, the company reported that 1,100 tonnes of spodumene concentrate were produced at Whabouchi, with an average grade of 6.2 percent Li2O from a bulk sample of about 10,000 tonnes of ore. The company also reported that an additional 4 tonnes of battery-grade lithium hydroxide were produced for its client Johnson Matthey (LSE:JMAT), with which it has a lithium hydroxide sales agreement. In the interview below, Bourassa discusses Whabouchi, the company’s Phase 1 Plant in Shawnigan and recent drill results from the Doris zone at Whabouchi. He also highlights the company’s lithium hydroxide sales agreement with Johnson Matthey, and the advantages the agreement brings to Nemaska. Investing News Network: Please give our investor audience an overview of Whabouchi and when production began at the Phase 1 Plant. Nemaska Lithium CEO Guy Bourassa: The Whabouchi project consists of a mine and concentrator located in the Eeyou Istchee James Bay region in the province of Quebec — about 300 kilometers north of Chibougamau — and a hydromet plant located in Shawinigan, Quebec, where we’ll be producing lithium hydroxide and carbonate from the concentrate produced at the Whabouchi mine. We have a feasibility study dated June 2016 for this commercial project. In parallel, we have decided to build and operate a small commercial plant that we call the Phase 1 Plant. The main purpose of the Phase 1 Plant is to provide commercial representative samples of our products to clients in order to prequalify our products while we’re building the commercial plant. The Phase 1 Plant began production of lithium hydroxide in February of 2017, using lithium sulfate provided by a client. We started delivering high-quality, battery-grade lithium hydroxide to that client in June. We expect to start processing spodumene concentrate coming from the mine this August/September. INN: Can you please tell us about your lithium hydroxide sales agreement with Johnson Matthey, and what your collaboration with the company’s battery materials team has brought to the operation? GB: We have, in fact, two agreements with Johnson Matthey, located in Candiac in the province of Quebec just south of Montreal. We have a long-term supply agreement for lithium salts with them, as well as a collaboration and tolling agreement using the Phase 1 Plant. We have collaborated with the Johnson Matthey team throughout the startup period of the Phase 1 Plant, helping us adjust the process so that we can produce high-quality lithium hydroxide for them. They have been very dedicated in making sure that we understood their product requirements when it comes to lithium hydroxide needs, as well as being flexible in our production scheduling as we started the plant. They have been a great partner and customer and I am very glad that we have worked with them. INN: When do you expect to begin production using Whabouchi concentrate? GB: We expect to start producing lithium salts from Whabouchi concentrate in late August, which will allow us to have the first commercial material to potential clients by the end of September of 2017. These are commercial samples that customers will use to qualify us as a supplier. INN: Can you tell us about the results of your bulk sample program at Whabouchi, and your ability to produce high-quality plastics for sand concentrate? GB: We ran a bulk sample over 23,000 tonnes of ore that was mined in the eastern portion of the open pit in the main dyke, so it’s mine representative. We have processed roughly 10,000 tonnes coming from that material, and the head grade was over 1.7 percent Li20, which is very good quality for such a large bulk sample. We produced roughly a little over 1,000 tonnes of dense media separation (DMS) concentrate averaging over 6.25 percent Li2O. The standard in the market is 6 percent. Again, that has been a very successful bulk sample. About 50 percent of our concentrate will be made using DMS. We obviously also generate fine materials that are to be processed in a flotation concentrator. That was not installed in Whabouchi bulk sample, so we sent the fine materials to SGS in Lakefield, where we’re currently producing flotation concentrate. By the end of August, we should have completed the small production to have mine-representative material also coming from the flotation process. INN: You recently announced drill results from the Doris zone. Please share some highlights from the results and what they mean for the new pit design and five-year mine life. GB: We recently completed infill drilling for the five-year mine plant and a couple of holes to continue the definition of the Doris zone, which was found in 2016. The results of the exploration or additional drilling have shown the extension of the Doris zone to the east and continuing parallel to the main dyke of the Whabouchi deposit. We are currently working on finalizing an optimized open-pit design. We should have the results of that by the end of Q3. INN: What catalysts can investors look for in the next 12 to 18 months? GB: Investors should expect major catalysts like the start of production of commercial samples of lithium hydroxide and lithium carbonate from the concentrate produced at the mine, which we expect in Q3 and Q4 of 2017. That will allow us to start the qualification process for products with potential clients, which should result in the signing of additional offtake agreements. Investors can also expect the construction of the Whabouchi mine concentrator to be completed within the next nine to 12 months, and the start of commercial operations there. They will also see the evolution of the construction of the hydromet plant in Shawinigan over the next 18 months following the project financing, which we hope to announce and complete in the coming one to two months. INN: How well financed is Nemaska to reach these goals? GB: In the last 12 months we have raised a little over $110 million in equity to advance the commercial project, aside from the financing organized for the Phase 1 Plant construction and operation. It allowed us to accelerate the detailed engineering and it is progressing well. Most of the long-lead items have been identified and will be ordered shortly. We’ve [also] been able to build some infrastructure at the mine site. We are planning to complete the balance of the financing required to complete construction this fall. 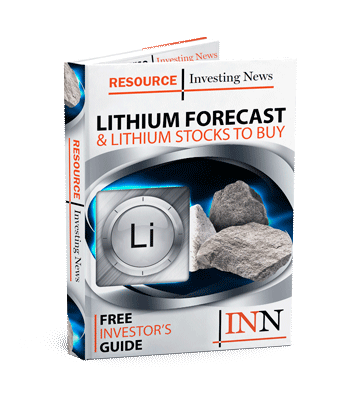 INN: Finally, what are the near-term and long-term outlooks for the lithium market and lithium producers? GB: The outlook is great for the lithium market, lithium producers and newcomers like Nemaska. Albemarle (NYSE:ALB), FMC (NYSE:FMC) and SQM’s (NYSE:SQM) latest quarterly reports state that sales prices are increasing, demand remains strong and we’re still living through a shortage of supply for the battery-grade materials. Big car manufacturers like Volkswagen (ETR:VOW3) are committed to having 25 percent of sales be all electric by 2025. I don’t know if people realize, but that alone would take four projects — like Whabouchi — to solely meet Volkswagen’s 2025 demand. So this is huge, very huge. We see a bright future for the lithium space and we’re a part of it.